So when is it that a job on your car becomes bigger than you first thought? In my experience, almost every time. 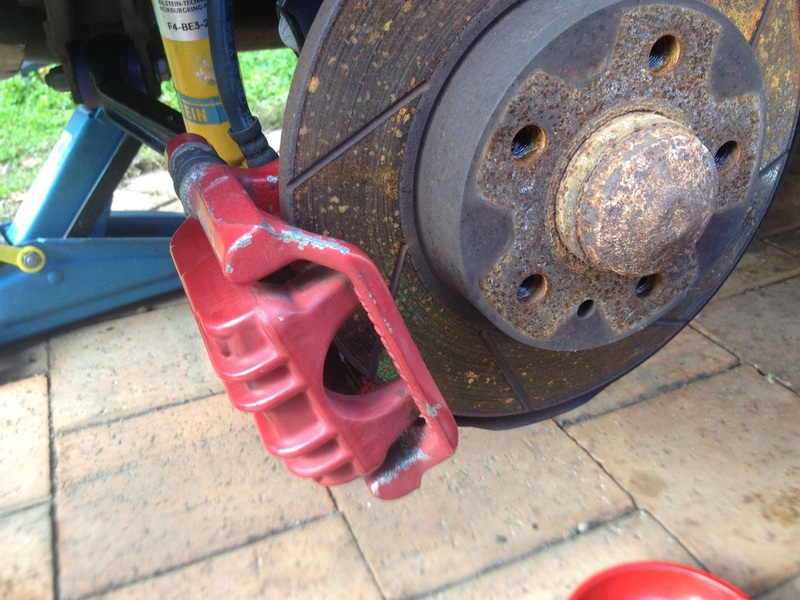 It started out as a simple replacement of rear brake pads. And then the little OCD voice in my brain kicked in. "If you're going to replace the brake pads, you really should repaint the rear callipers....and then if you're going to paint the rear callipers, you should redo the front ones....and then, if you're going to take all those wheels off, you should replace the wheels' centre badges with the Alfa Romeo ones you've always been planning on. 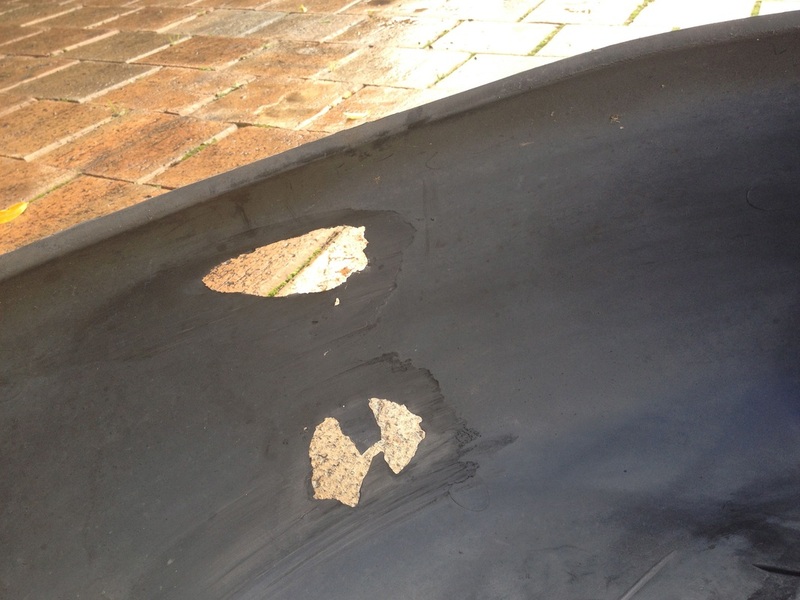 and don't forget the main job you've been waiting to do....you've also got to replace the rear wheel arch inner liners that have been wrecked by the scraping suspension." You may know that I've upgraded the suspension on the GTV by fitting Bilstein dampers and PowerFlex urethane bushes to match the performance of the Novitec springs that had been fitted by a previous owner. 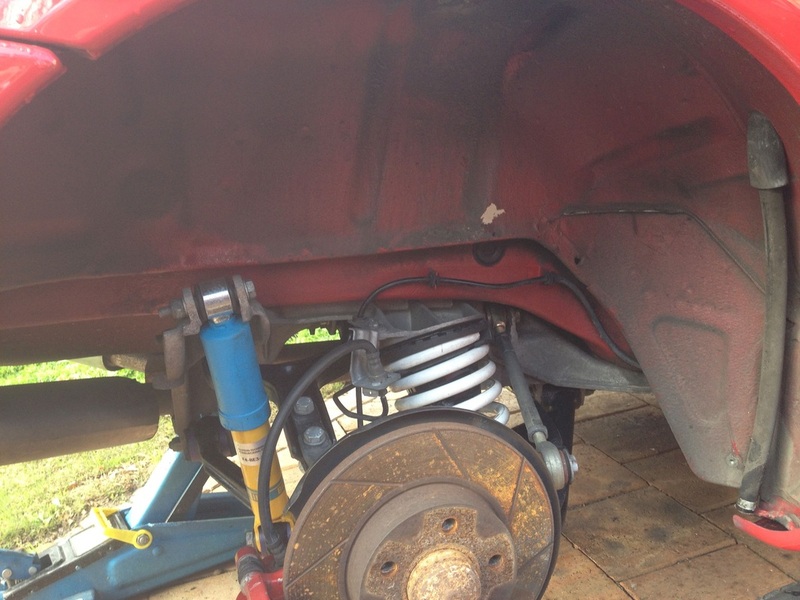 The lowered springs, with standard dampers and worn bushes, had conspired to produce severe negative camber on the rear suspension and bottoming out which wore through the rear liners, as you can see here. Removing the liners was a major challenge. The manual expects the sill covers to be removed and the suspension to be dismantled to facilitate removal of the liner. Time, determination, stubbornness and brute force were required to remove the liner without dismantling the other components. The rear callipers showing how time and wear had wrought their havoc. Paint job on rear callipers in progress. 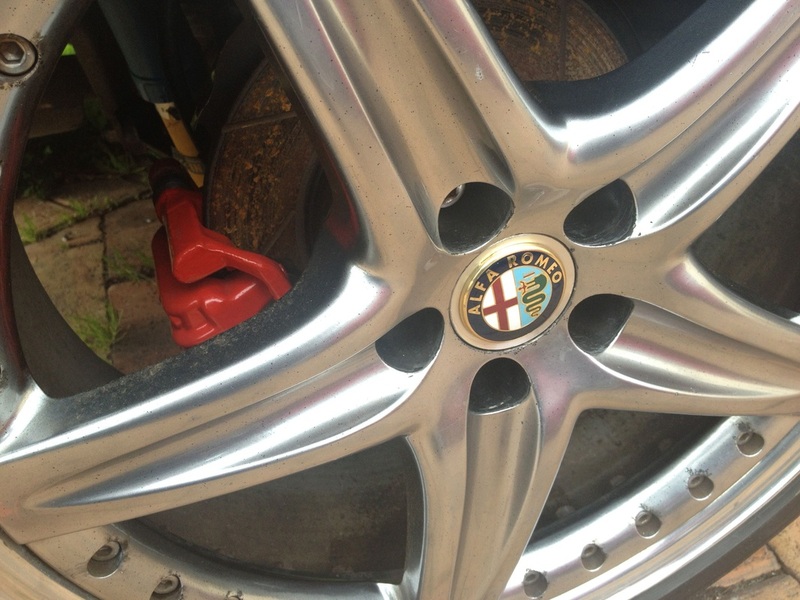 Showing the badges fitted to the ROH Modena 3-piece wheels. The badges came from an Alfa 155 imported from the UK. 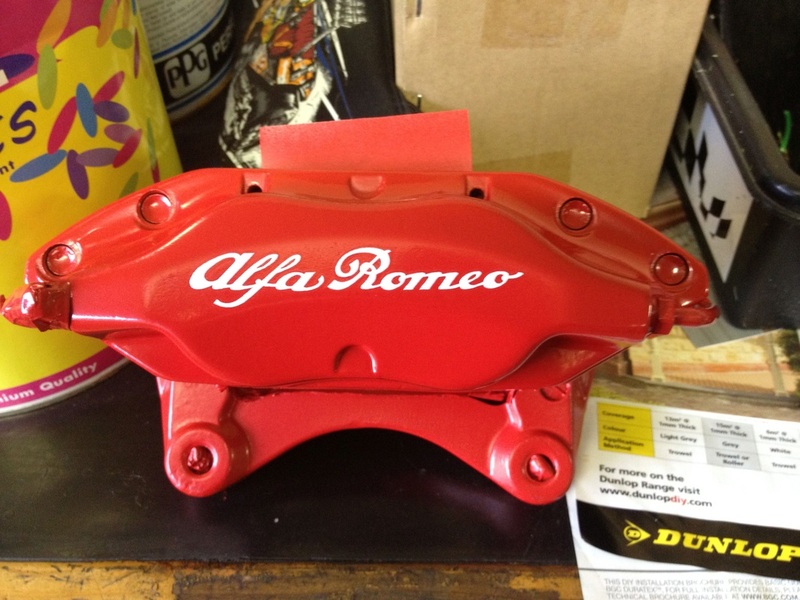 The front calliper ready for treatment. The finished product. 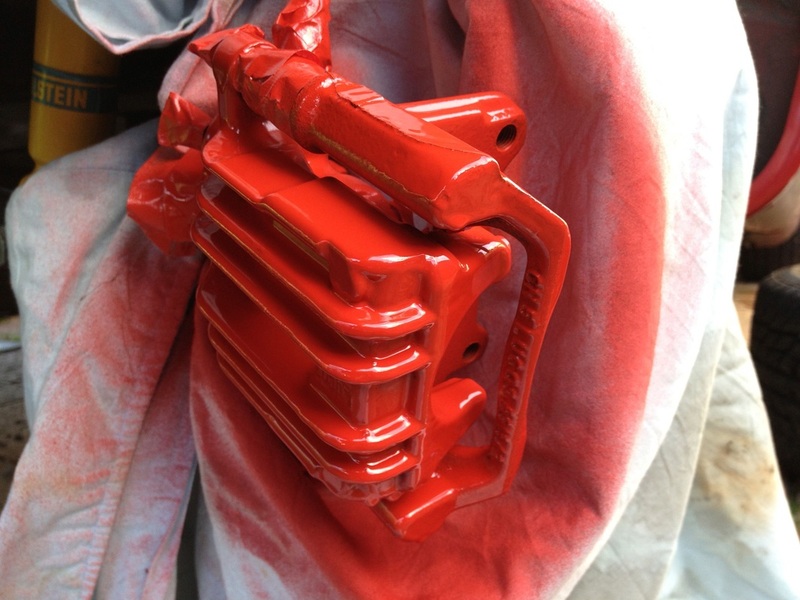 The calliper was firstly painted in HT red calliper paint, then a HT sticker was applied, then over-coated with HT clear. Looks pretty huh? Here are my thoughts, photos, reflections and stories of my life with my Alfa Romeo cars.